In sync with its network expansion and modernisation plan, Telenor is also planning to expand its retail outlets, by adding at least 14,250 new sales outlets by year-end and taking its retail base to over 80,000. The company has also announced rollout of about 950 new sites in the Bihar and Jharkhand circle as part of its expansion and modernisation plan. The work on the new sites has already started and is expected to be over by the end of 2015. At present, the company offers voice and data services on a 2G network and has 22% of its subscribers accessing Internet. It is working with Huawei India to modernise its existing network and make its future ready across its six operational circles. As part of the deal, in the next two years, 24,000 sites in Telenor circles will be swapped and modernised with equipment offering enhanced power and spectral efficiencies. 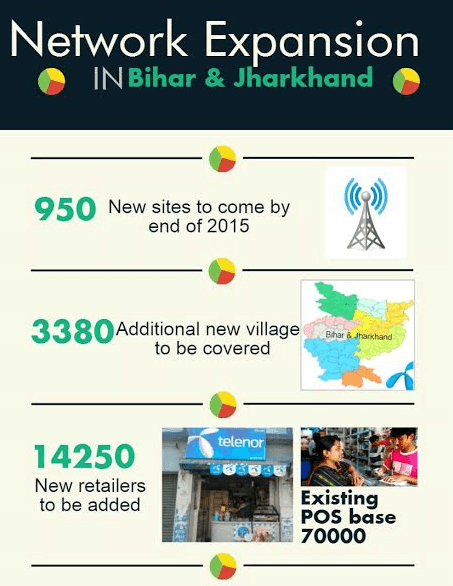 In the first phase, 5,000 sites covering 100 towns will be ready to deliver high speed Internet services by end of this year.